This article reports massive right-sided hemorrhagic pleural effusion as the sole manifestation of pancreatitis in a 16-year-old Iranian boy. The patient referred to Nemazee Hospital, the main hospital of southern Iran, with right-sided shoulder and chest pain accompanied with dyspnea. His chest x-ray showed massive right-sided pleural effusion. The pleural fluid amylase was markedly elevated (8840 U/L), higher than that in the serum (3318 U/L). Abdominal CT scan showed a cystic structure measuring about 5·2 cm in the head of pancreas, highly suggestive of a pancreatic pseudocyst. Pleural effusion resolved after 3 weeks of chest tube insertion but not completely. After this period of conservative therapy another CT scan showed that pseudocyst was still in the head of pancreas. So, external drainage was done with mushroom insertion and the patient was discharged after 40 days of hospitalization. The cause of pancreatitis could not be identified. Pancreatitis should be taken into consideration when hemorrhagic pleural effusion, especially in the right hemithorax occurs. Hemorrhagic pleural effusion, especially in the right hemithorax, rarely occurs as the sole manifestation of pancreatitis [1–6]. Most cases of hemorrhagic pleural effusion secondary to pancreatitis are between the ages of 20 to 55, and patients are alcohol drinkers [2, 5]. This article reports massive right-sided hemorrhagic pleural effusion as the sole manifestation of pancreatitis in a 16-year-old Iranian boy. 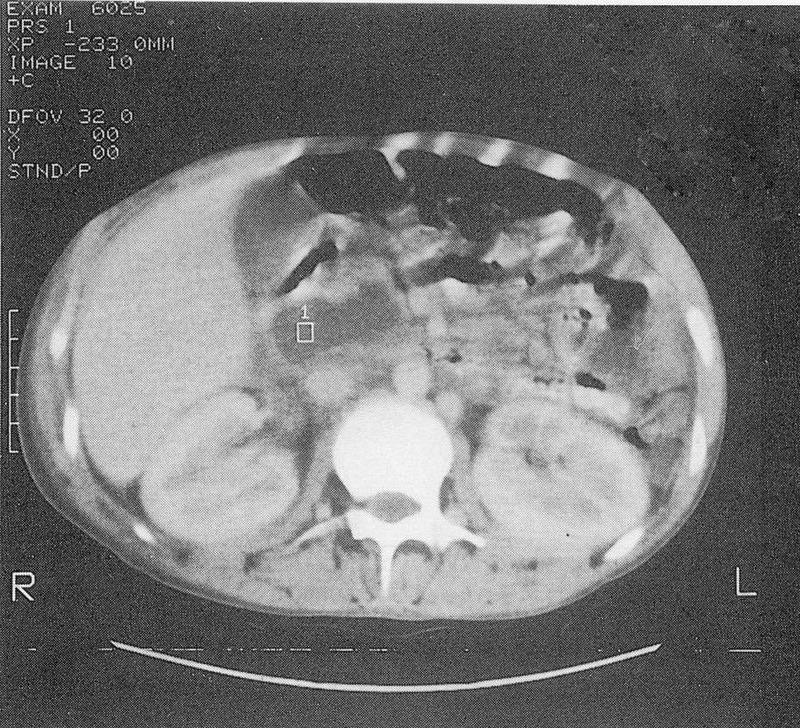 This 16-year-old boy, from a village in Fars Province, Southern Iran, developed left paraumblical (sometimes epigastric)abdominal pain with moderate intensity about five months prior to admission. The pain subsided after three months. However, 20 days later, the patient developed right-sided shoulder and chest pain accompanied with dyspnea. The patient's severe shoulder pain was mismanaged by a physician who considered it musculoskeletal pain. The patient then referred to Nemazee Hospital, the main hospital of southern Iran. His chest X-ray showed massive right-sided pleural effusion and thoracentesis revealed a dark red bloody effusion with: amylase: 8840 U/L (serum amylase: 3318 U/L), protein: 2.5 mg/dL (serum albumin: 4.1 mg/dL), lactate dehydrogenase (LDH): 227 U/L (serum LDH: 335 U/L), cell count: 590000 cells/mm3 with 2500 WBC/mm3 which has 73% segment, 2% lymphocyte and 6% mesothelial cell. Acid fast staining ofpleural fluid was negative three times. The results of pleural biopsy and pleural fluid culture for Tuberculosis were negative as well. Important peripheral blood laboratory values were as follows: hemoglobin: 9.2 g/dL; white blood cell count: 7700/mm3; platelet count: 421000/mm3; mean corpuscular volume: 63.3 fl; mean corpuscular hemoglobin: 18.7 ∝g; fasting blood sugar: 96 mg/dL; lactate dehydrogenase:335 U/L (nl: 120–230 U/L); serum glutamic-oxaloacetic transferase (SGOT):40 U/L; serum glutamic-pyruvic transaminase (SGPT): 15 U/L; alkaline phosphatase: 119 U/L; total bilirubin: 0.4 mg/dL; direct bilirubin: 0.2 mg/dL; prothrombin time: 13_ (control: 13_); partial thromboplastin time: 50_ (control: 35–45_); total calcium: 9.2 mg/dL; albumin: 4.1 mg/dL; triglyceride: 89 mg/dL (nl: 60–160 mg/dL); erythrocyte sedimentation rate (Westergen): 18 mm/hr; serum C-reactive protein: 12 mg/L (nl: <8 mg/L); serum fibrinogen: 215 mg/dL (nl: 200–400 mg/dL); fibrin split products: 9 ∝g/mL (nl: <10 ∝g/mL). Pleural fluid cytology (three times) and bronchial washing cytology were also negative. Due to markedly elevated serum and pleural fluid amylase abdominal CT scan was done 2 days after insertion of chest tube at the 8th day of hospitalization. The imaging showed a cystic structure measuring about 5 × 2 cm in the head of pancreas, highly suggestive of a pancreatic pseudocyst (Fig. 1). Also, abdominal ultrasonography revealed a small septated cystic structure in the head of the pancreas which was edematous and suggestive of pseudocyst of acute pancreatitis. Hepatobiliary tract and gall bladder were devoid of any gall bladder lesions, including stones. The patient had no history of drug and alcohol intake or abdominal trauma. His sweat chloride concentration was 21 meq/L. Chest tube was inserted for three weeks, during this period the clinical symptoms such as dyspnea and chest pain improved but not completely. Thedaily drain output was about 1500 cc at the first day of chest tube insertion but it decreased gradually. After this period of conservative therapy another abdominal CT scan showed a mass measuring 3·4 cm in the head of pancreas with possibility of pseudocyst. No evidence of pancreatic duct dilatation or common bile duct dilatation was seen. Therefore external psendocyst drainage was done with mushroom insertion. Mushroom was removed after one week when no drainage was seen. Finally the patient was discharged after 40 days of hospitalization. The cause of pancreatitis could not be identified. Intrathoracic neoplasms, trauma, bleeding diathesis or tuberculosis may cause hemorrhagic pleural effusion as well . Right-sided hemorrhagic pleural effusion as the sole manifestation of pancreatitis is rare [1–4, 6, 7] especially when it occurs in the non-alcoholic patient under the age of 20 [2, 3]. The postulated pathogenic mechanisms for hemorrhagic effusions include transdiaphragmatic transfer of fluid via lymphatics, diaphragmatic perforation of pseudocyst and mediastinal extension . Several studies demonstrated that a fistula connecting a pancreatic pseudocyst with pleural cavity was the mechanism of pleural effusion [4, 7]. Although the cause of pancreatitis could not be identified in our study, other studies have shown that pleural effusion with a very high pancreatic enzymes activity most frequently occurs in patients with alcoholic pancreatitis [5, 8–10]. Pleural effusions due to pancreatic diseases are mostly reactive with slightly elevated amylase levels. Very high levels of amylase in the pleural fluid are rare and can only be explained by the rupture of a pancreatic pseudocyst with perforation into the pleural cavity such as by drainage of pancreatic fluid into the pleural cavity . Regarding elevated pleural fluid amylase, perforation of pseudocyst into the pleural cavity seems to be the mechanism of hemorrhagic pleural effusion in this case. The other causes of hemorrhagic effusions with an increased amylase include traumatic esophageal rupture and intrathoracic and other neoplasms . In most cases, the pleural effusion occurs concomitantly with the signs and symptoms of pancreatitis, but may occur even after the acute abdominal symptoms have subsided. Considerable diagnostic problems may be encountered in cases in which the clinical picture is dominated by the pleuro-pulmonary symptoms, and the pancreatic condition remains completely or partly in the background . An early and rapid diagnosis can be made by the examination of the pleural fluid for elevated amylase . Visual methods such as computed tomography, ultrasonography, endoscopic retrograde cholongiopancreaticography (ERCP) are also useful . Treatment with drainage by a chest tube, with concomitant conservative treatment of the pancratitis, is usually effective in massive pancreatic pleural effusions. If drainage by a chest tube fails, percutaneous catheter drainage of the abdominal pseudocyst can be considered for treatment . Pancreatitis should be taken into consideration when hemorrhagic pleural effusion occurs, especially when it occurs concomitant with elevated amylase level of pleural fluid. In such a condition visual methods such as CT scan, ultrasonography and ERCP are so helpful. Treatment with drainage by a chest tube, with concomitant conservative treatment of the pancratitis, is usually effective in massive pancreatic pleural effusions. The authors thank Dr. E. Mojtahedi, Associate Professor of Internal Medicine, Shiraz University of Medical Sciences, for his encouragement and also the patient, introduced as case report, for giving us a written consent for publishing this case report. Both authors actively participated in the conception, data collection and interpretation and writing of this article.